© 2002, © 2018 by Paul Freeman. Revised 4/29/18. 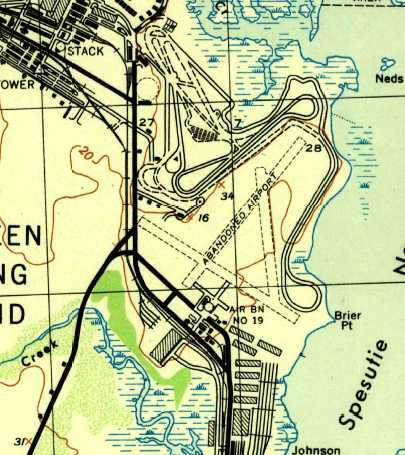 Aberdeen Airpark, as depicted on the 1946 USGS topo map. 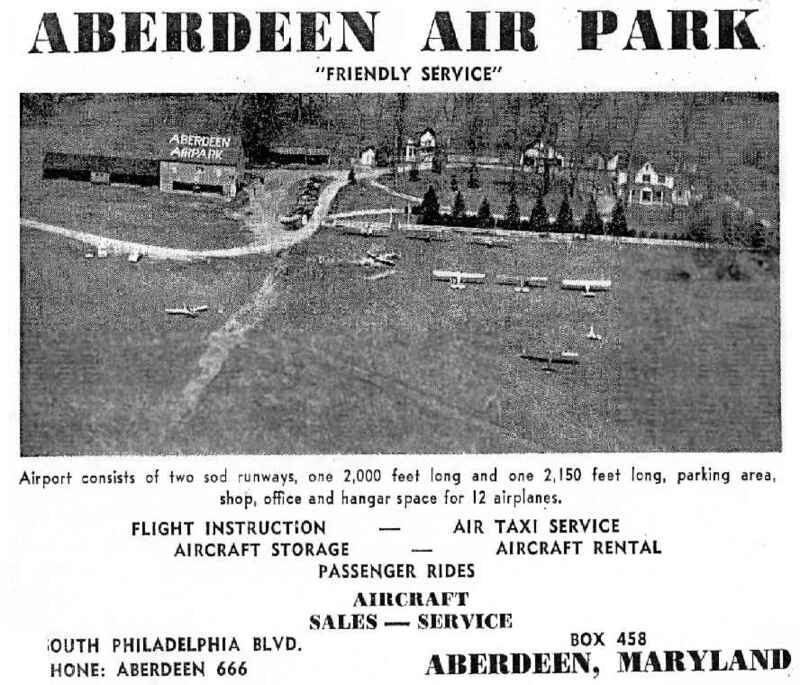 Aberdeen Airpark opened in about 1946.
and was said to comprise of a 100-acre property between Route 40 on the south & a railway line on the north. It offered flight instruction, charter, fuel, and minor repairs. Its 2 runways were 2,100' & 1,800' long. 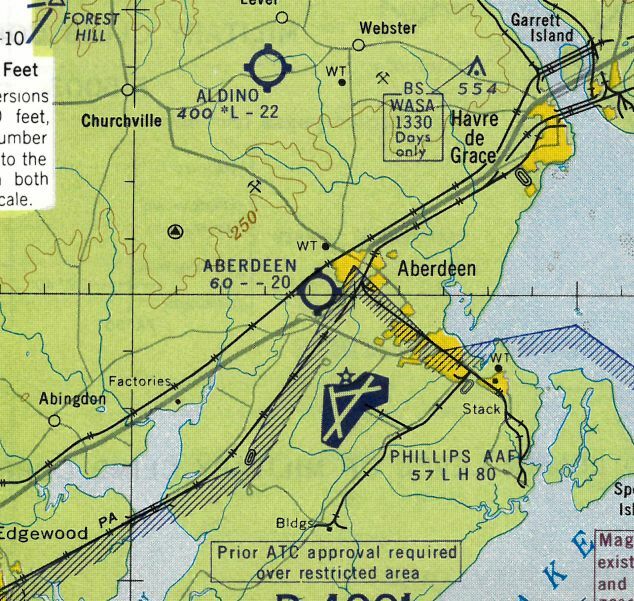 The earliest depiction of Aberdeen Airpark which has been located was on the 1946 USGS topo map. 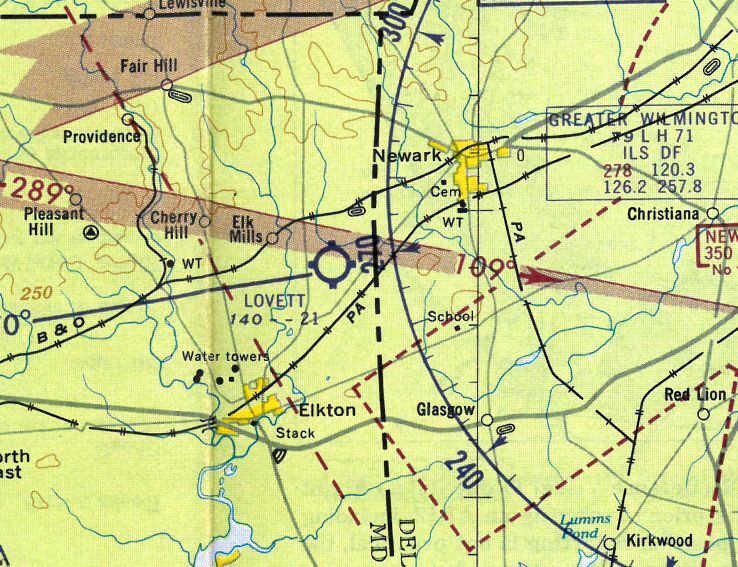 Aberdeen Airpark was not yet depicted on the April 1947 Washington Sectional Chart (according to Chris Kennedy). was on the November 1947 Washington Sectional Chart. It depicted Aberdeen as having a 2,400' unpaved runway. and to have 20 aircraft based on the field. and later for the Army's Aberdeen Proving Ground. Hill & his wife lived in a home on the airport property. 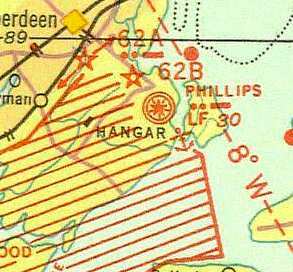 The Albatross Flying Club was based at Aberdeen Airpark. 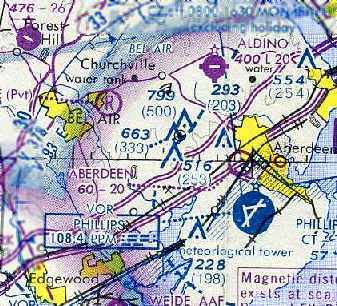 depicted Aberdeen Airpark as having 2 turf runways: 2,400' east-southeast/west-northwest & 2,000' west-southwest/east-northeast. Several small hangars & buildings were depicted on the northwest side of the field. 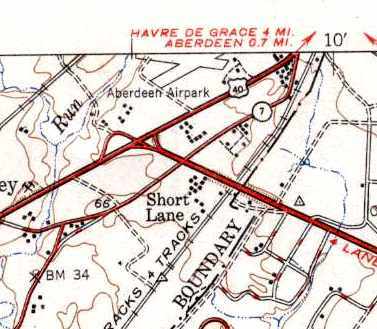 The 1951 USGS topo map depicted Aberdeen Airpark as having 2 unpaved runways. 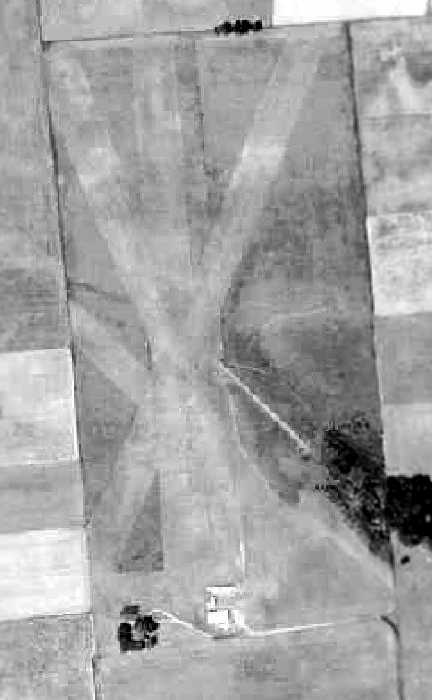 The earliest photo which has been located of Aberdeen Airpark was a 4/10/52 USGS aerial view. 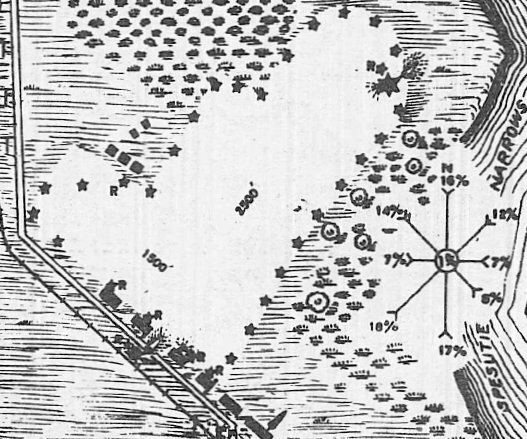 It depicted the field as having 2 grass runways, with 6 light planes parked around several small buildings on the northwest side. and the headquarters of the Albatross Flying Club. An advertisement for Aberdeen Airpark from a 1953 directory (courtesy of Mike Wotovitch). depicted the field as having 2 grass runways. and holds a special spot in my life since I flew my first solo & did much of my flying from there. an obviously rattled Marine F4U pilot opted for this rain-soaked muddy runway. showed a total of 11 single-engine aircraft parked on the field. 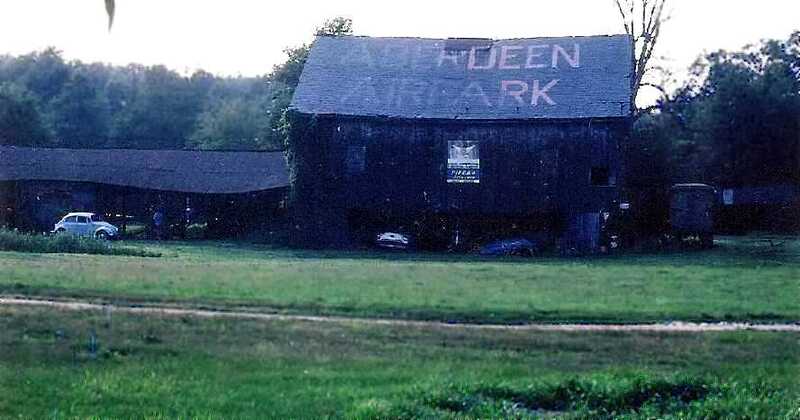 A circa 1950s photo by Mike Wotovitch of the barn/hangar painted “Aberdeen Airpark”. Joe Regan recalled, “Aberdeen Airpark is the airport from which I had my very 1st airplane ride in a Piper Tri-Pacer at age 10. 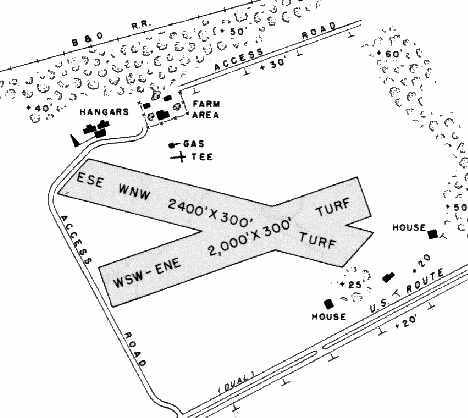 Our family home was located in a small tract on the edge of the airfield. I would walk across the corn field & hang around operations trying to find things to do. It was actually quite a busy place around that time while owned by the Hill family. I was friends with their son, Clayton. depicted Aberdeen Airpark as having a 2,000' unpaved runway. was on the March 1977 Washington Sectional Chart (courtesy of Chris Kennedy). It depicted Aberdeen as having a 2,000' unpaved runway. was its listing in the 1979 AOPA Airport Directory (according to the book "Maryland Aloft"). and the property was developed into housing in the same year. 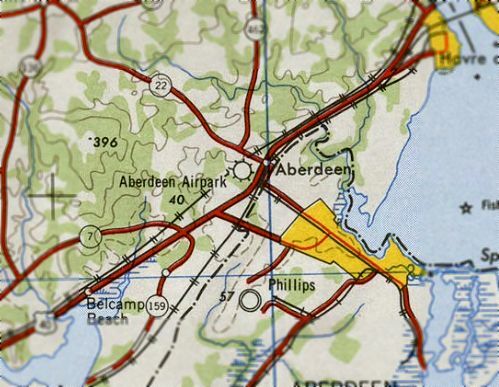 By the time of the 1982 USGS topo map, the Aberdeen Airpark was no longer depicted at all. with not a trace recognizable of the former airport. The site of Aberdeen Airpark is located at the intersection of Edmund Street & Cornwall Street. 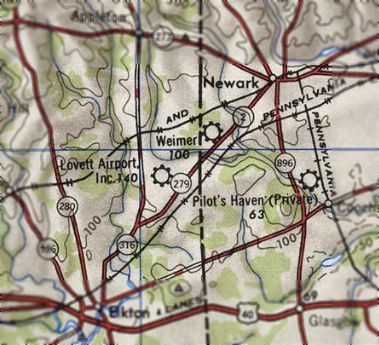 Lovett Airport, as depicted on the 1946 USGS topo map. or the 1946 Washington Sectional Chart (courtesy of Mike Keefe). (replacing the original Lovett Field just across the state line in Delaware). 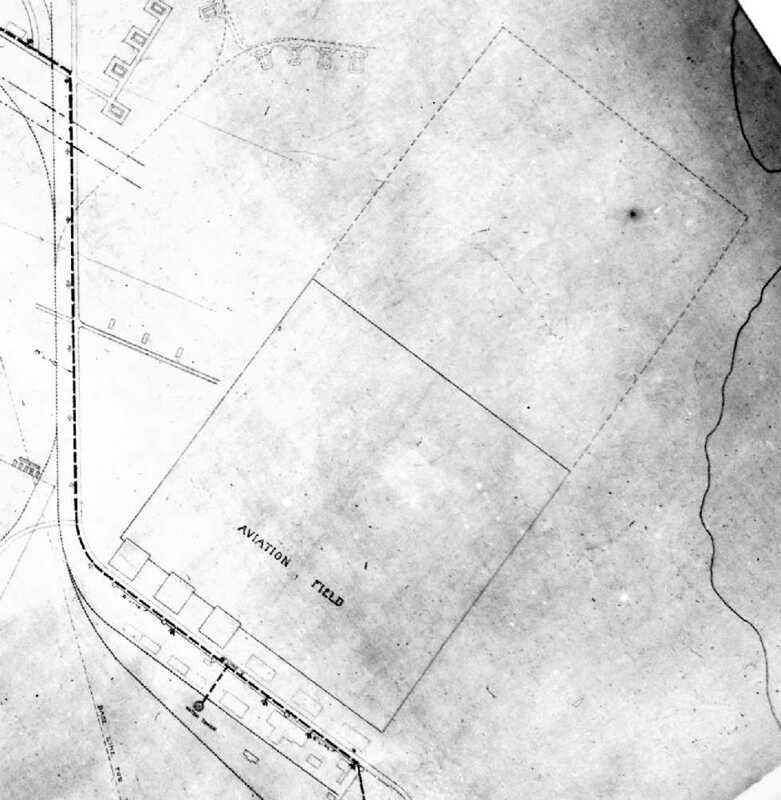 The earliest depiction which has been located of Lovett Field in Maryland was on the 1946 USGS topo map. and 70 aces that were usable for landing. Waldo Lovett of Newark, Delaware, was listed as the owner & manager. 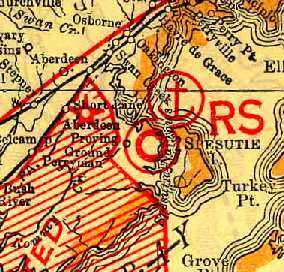 was on the 1947 Washington Sectional Chart. 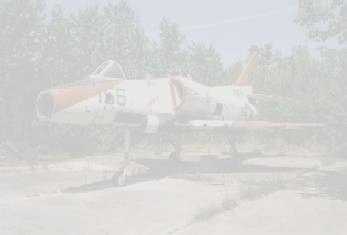 It described the field as having a 2,200' unpaved runway. 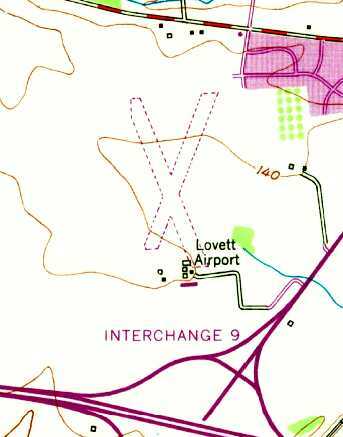 depicted Lovett Airport as having 3 turf runways (the longest being 2,150'). 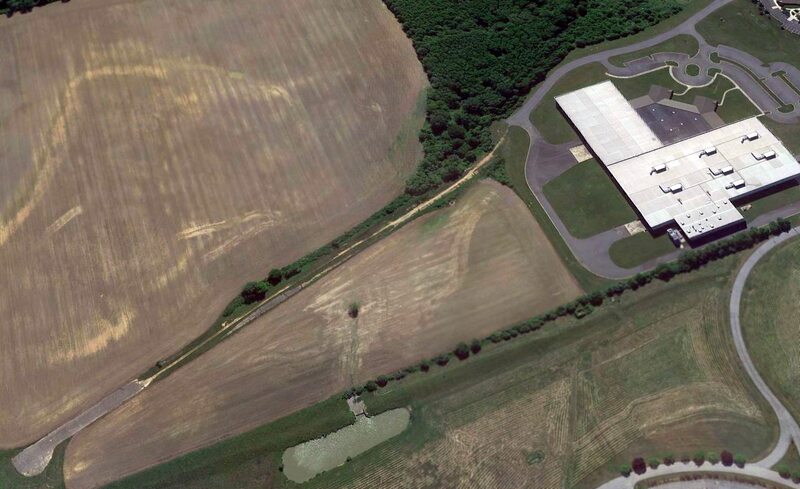 Several small hangars & buildings sat at the south end of the field. 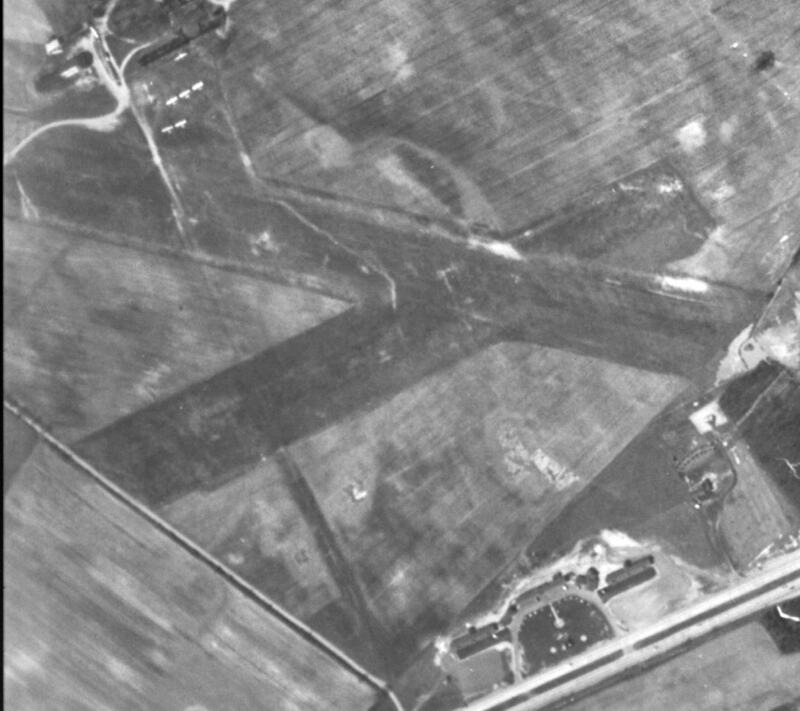 The earliest photo which has been located of Lovett Airport was a 1952 aerial view. with several small buildings at the south end of the field. 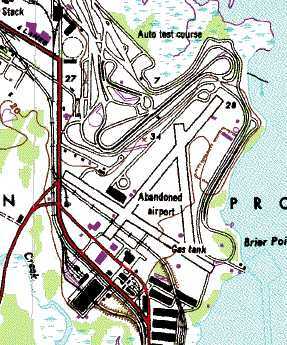 The 1953 USGS topo map depicted Lovett Airport as having 2 unpaved runways, with several buildings on the south side. showing the grass runways with several buildings at the south end. depicted Lovett Field as having a 2,100' unpaved runway. 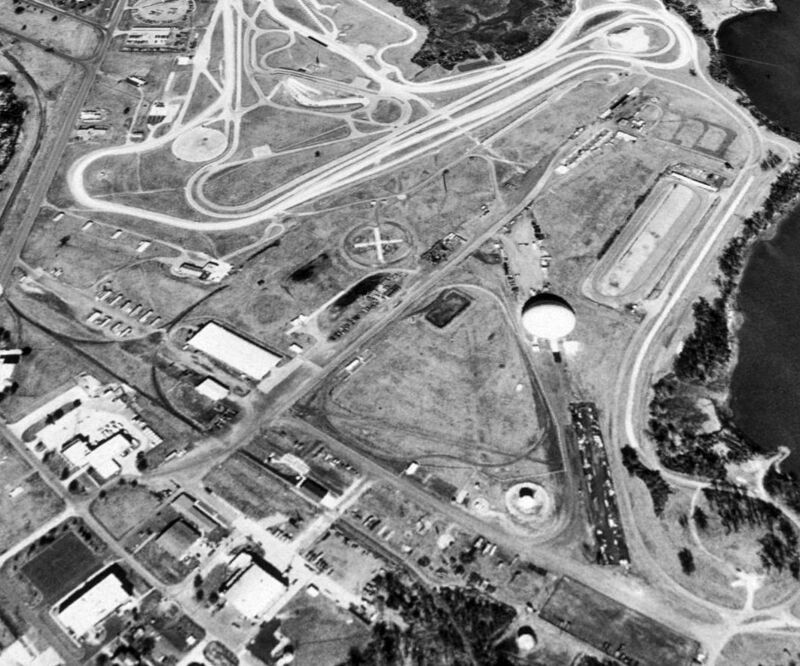 A 1961 aerial view depicted 2 single-engine aircraft visible parked outside at Lovett Field. and described as having 3 sod runways. The 1964 Washington Sectional Chart described the field in much the same manner. According to the book "Maryland Aloft", Waldo Lovett operated the field until as late as 1965.
and the manager was Jane Stradley. The field was labeled "Cecil County" on the 1967 Washington Sectional Chart (courtesy of Mike Keefe). 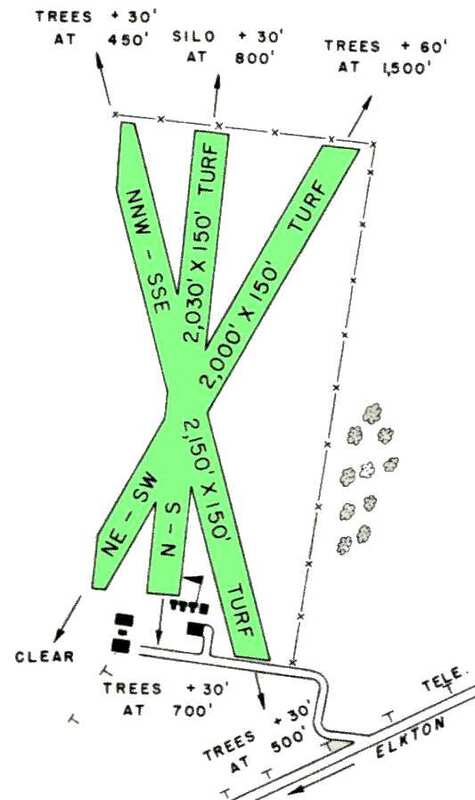 depicted Cecil County Airport as having 3 turf runways (the longest being 2,150' Runway 16/34). Several small buildings sat at the south end of the field. 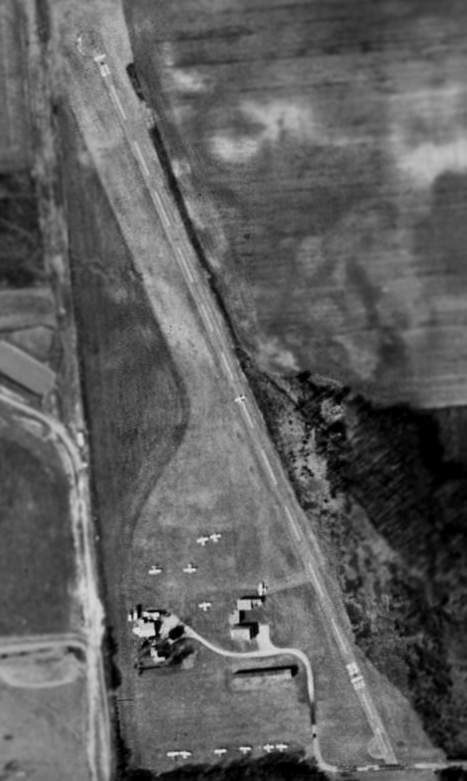 A 1968 aerial view depicted 3 single-engine aircraft visible parked outside at Cecil County Airport. depicted Cecil County as having a 2,100' unpaved runway. 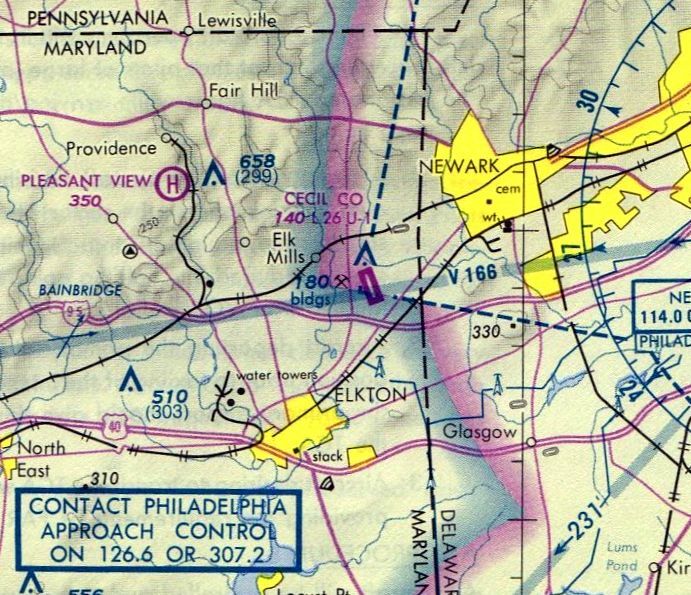 depicted Cecil County Airport as having a single 2,600' paved northwest/southeast runway. 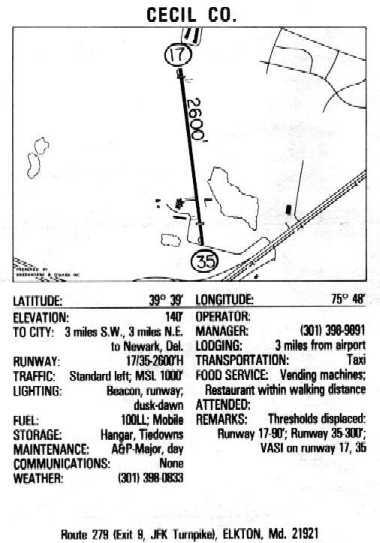 described Cecil County as having a single 2,600' asphalt Runway 17/35. 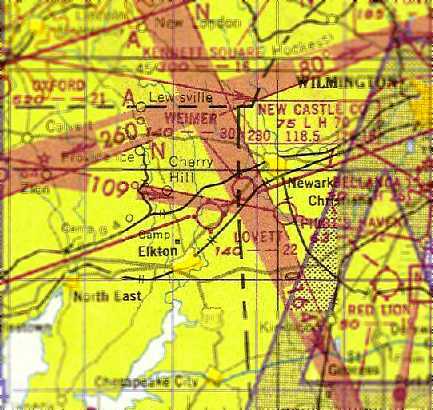 Diagram from 1987 Maryland State Aeronautical Chart. 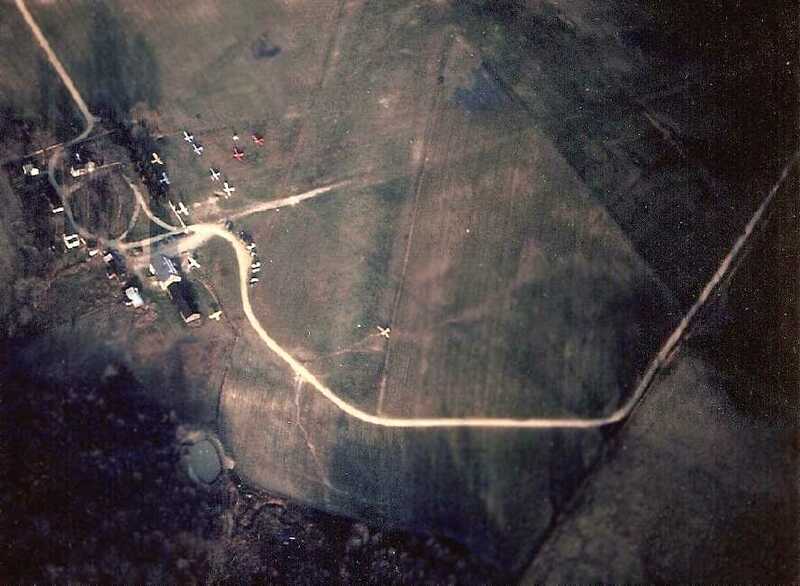 The 1992 USGS aerial photo was taken shortly before the field's closure. and one plane was on the middle of the runway. with a ramp & three buildings on the west side of the field. was on the March 1993 Washington Sectional Chart (courtesy of Carl Taylor). It depicted the field as having a single 2,500' paved runway. A 1997 aerial picture by Philip K. looking east at the Cecil Airport (shortly before it closed). Note the starkly reduced number of aircraft visible on the field compared to the 1992 photo – only 3 aircraft. 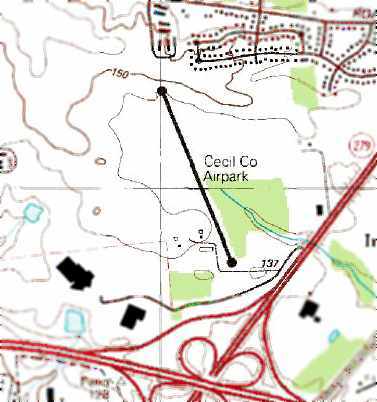 The 1998 USGS topo map depicted the original Cecil County Airport as having a single paved runway. when the increasing commercial value of the property caused the owner to sell the land to the WL Gore Company. It was no longer depicted at all on the 1998 Washington Sectional Chart (courtesy of Mike Keefe). Paul Freeman flew over the site in 2000. Only a few hundred feet of runway pavement remain at the north end of the runway. and a large office complex sits over the south end of the former runway. 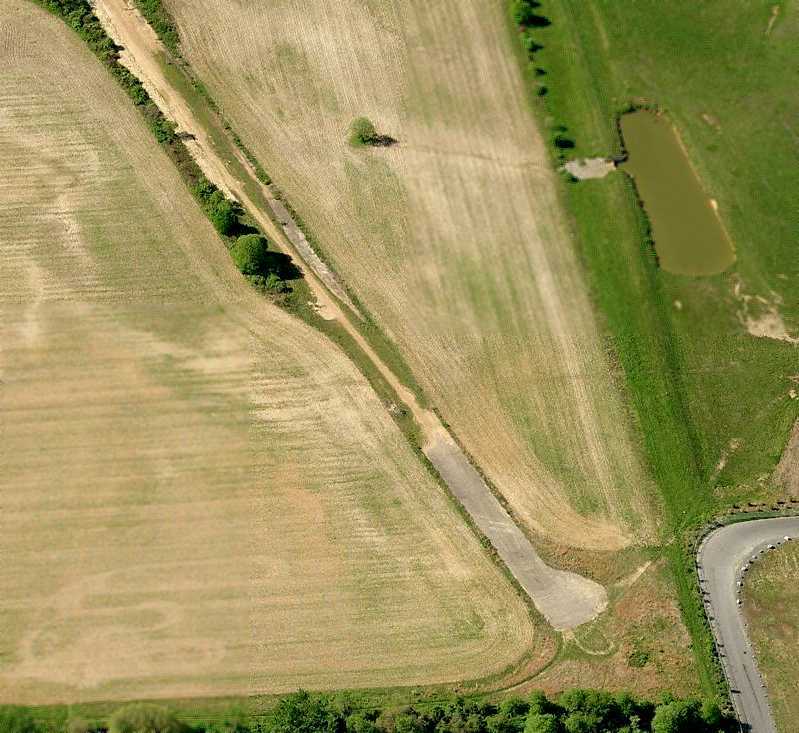 A circa 2006 aerial view of the remains of the original Cecil County Airpark shows the north end of the runway pavement remaining intact. but the northern end of the runway remained recognizable. has been renamed Cecil County Airport. Thanks to AJ Maltenfort for providing information about Cecil County. A map of the “Aviation Field” from a January 1919 completion report for Aberdeen Proving Grounds (courtesy of Ron Plante). 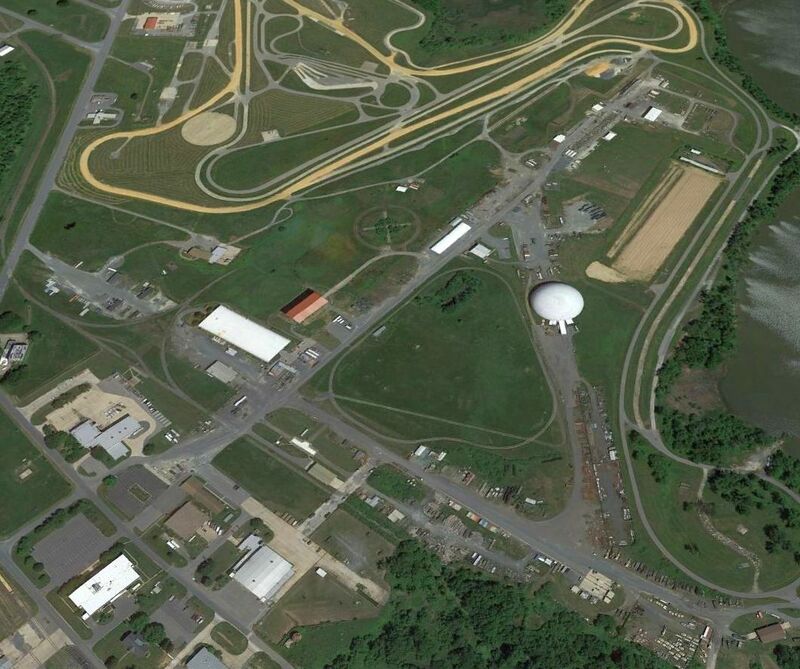 This former military airfield is located on the grounds of the Aberdeen Proving Ground. and a bombing field had been chosen near the Bush River." 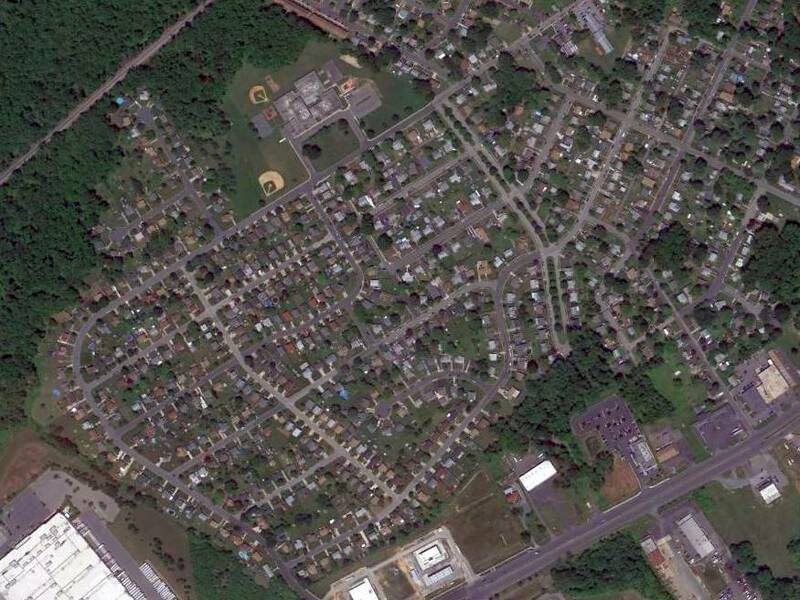 which depicted the “Aviation Field” as a rectangular area with 3 buildings along the southwest side. the techniques these tables provided were a means of improving the adequacy of aerial bombing. An undated photo of a Handley Page biplane bomber carrying a massive 4,000 pound bomb. In September 1921, a Handley Page bomber at Aberdeen Proving Ground dropped a 4,000 pound bomb - then a world record. 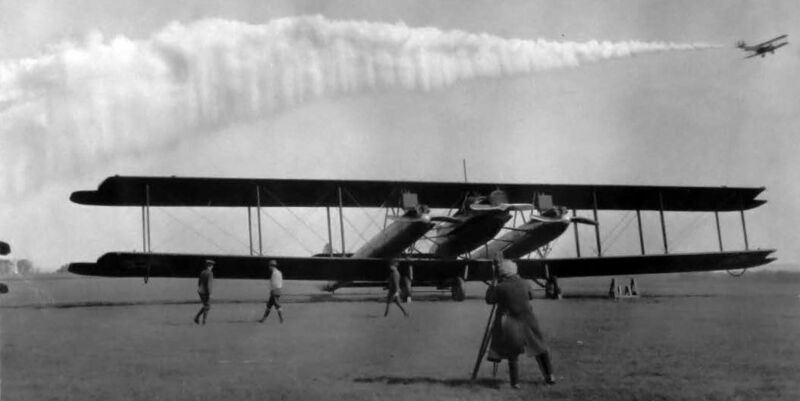 On 6/5/23, another Handley Page bomber crashed on takeoff at the proving ground. Pilot Lt. Wendell Phillips perished, but his actions were credited with saving the lives of 5 others onboard the plane. The airfield was shortly renamed in his honor. An undated photo of a JN-4 Jenny biplane at Phillips AAF. as an irregularly-shaped are offering a landing distance of 2,000'. 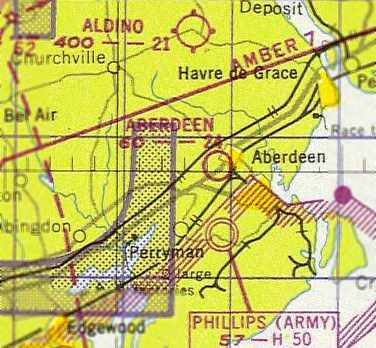 described Aberdeen as a government airfield, measuring 2,000' northwest/southeast by 2,000' northeast/southwest. It was said to have “several hangars, marked”. with 2 hangars in the background. with an Army Martin biplane bomber laying a smokescreen above it. 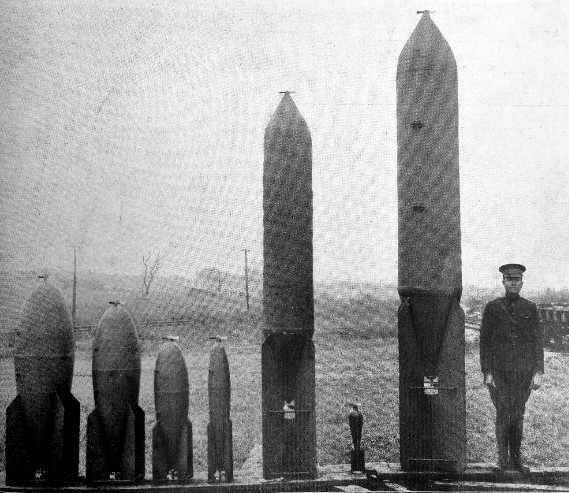 A 1926 photo of a massive 4,000 pound bomb at Aberdeen Proving Ground. described Philips Field as being 2,000' x 2,000' in size. depicted the original Phillips Field. along with the nearby Site 62A & 62B Airway Beacons. in the location eventually occupied by the replacement Phillips Field. A 1932 map shows the hangars & other structures south of the Phillips “Aviation Field” (from NARA Philadelphia, courtesy of Ron Plante). 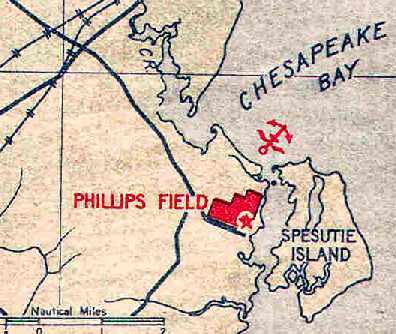 Phillips Field, as depicted on the 1934 U.S. Navy Aviation Chart (courtesy of Chris Kennedy). described "Phillips Field, Army" as having an "L" shaped, 2,500' x 1,500' sod landing area. It also said, "Field under construction, lights disabled. Pilots are cautioned to exercise extreme care in landing during daylight hours, unsafe for night operations." 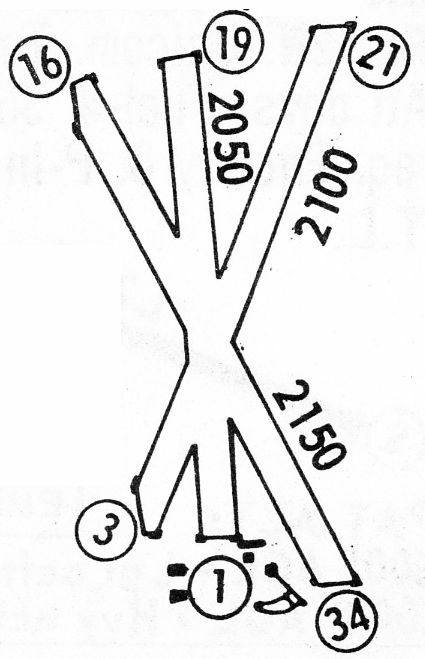 The original Phillips AAF, as depicted on the 1935 Washington Sectional Chart. 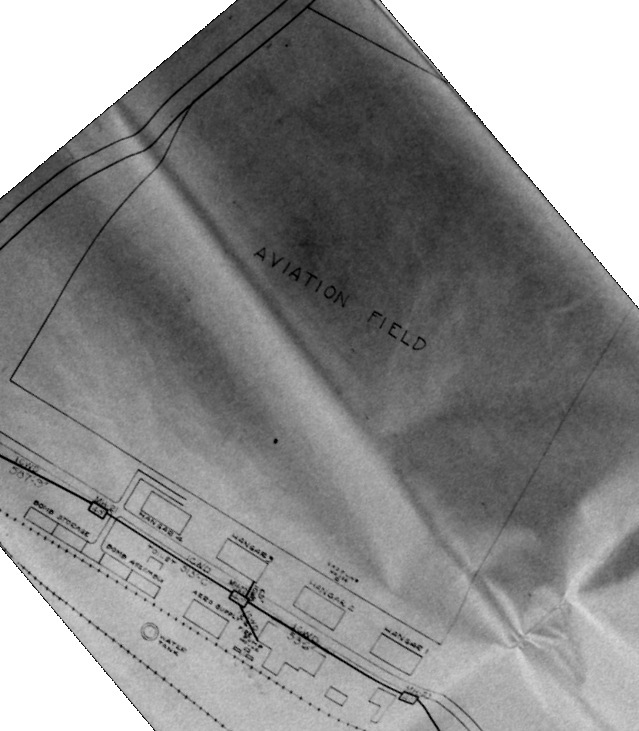 The 1935 Air Pilots Register (courtesy of Paul McMillan) described Phillips Field as an L-shaped sod field measuring 2,500' northeast/southwest by 1,500' northwest/southeast. with 3 paved runways: 3,000' northeast/southwest & northwest/southeast, and 2,400' north/south. A hangar & other buildings were said to be located on the south side of the field. from the Airport Directory Company's 1937 Airports Directory (courtesy of Bob Rambo). The directory described Phillips Field as having 3 hard-surfaced runways, with the longest being 3,000'. and that a 75mm aircraft cannon was test first here during a B-18 flight in 1939." along with the notation, "Civilian emergency use only." 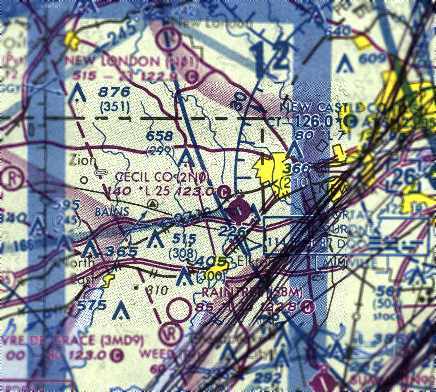 as the original airfield was not large enough to operate modern bombers. 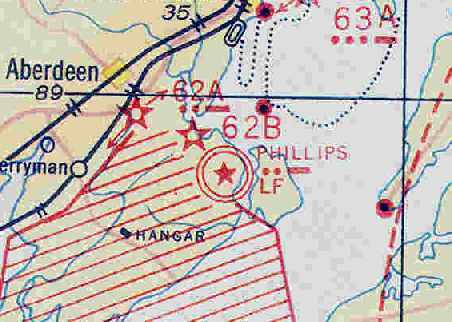 The original Phillips Field was depicted as "Abandoned Airport" on the 1944 USGS topo map. only the new Phillips Field was depicted. with 3 paved runways (the longest being 4,400'). An auto test course had been constructed adjacent to the north side of the field. as well as the hangar which remains standing at the south side of the field. 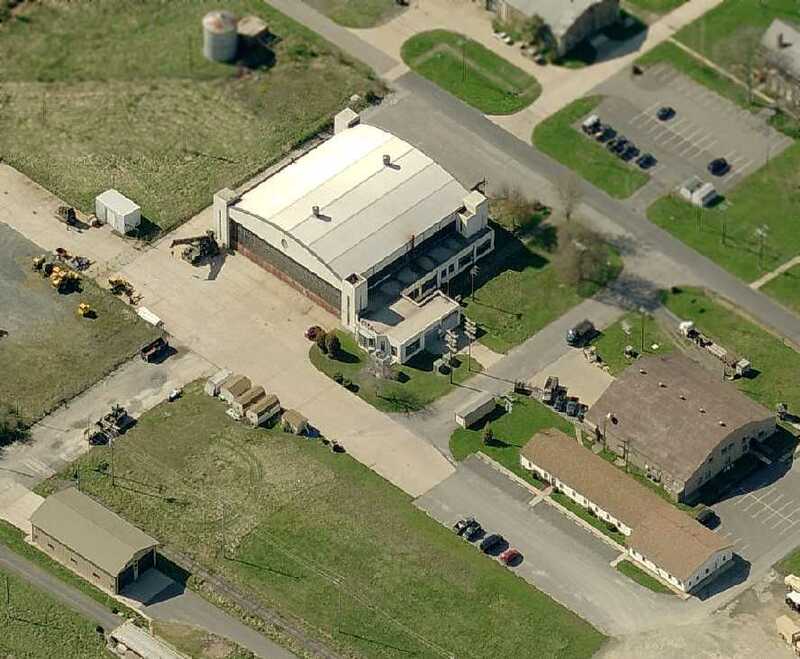 A circa 2006 aerial view looking south at the 1930s-era hangar which remains standing at the site of Philips Field. Note the attached airfield operations office. A 2013 aerial view looking north showed the original Phillips Field's 3 former runways were still recognizable. 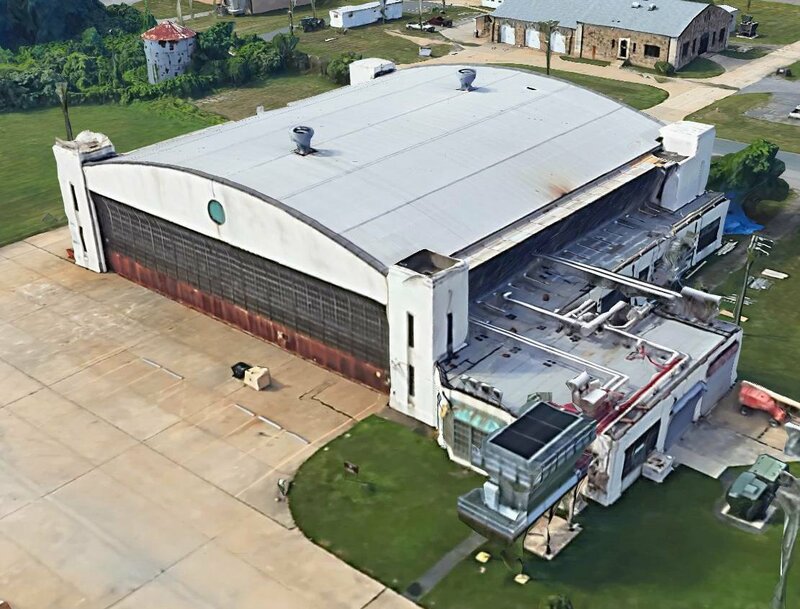 A circa 2013-2018 3-D aerial view looking south at the 1930s-era hangar which remains standing at south side of the site of Philips Field, with the attached airfield operations office.